As in the Sacrament of Holy Orders, the recipients of the Sacrament of Matrimony also dedicate themselves to the salvation of others. Christ instituted this sacrament when he attended the wedding of Cana, through his preaching in regards to the permanent union of a man and woman in marriage, and through the indissoluble bond that exists between the married man and woman. Furthermore, this sacrament has its roots in the creation of man and woman by God. 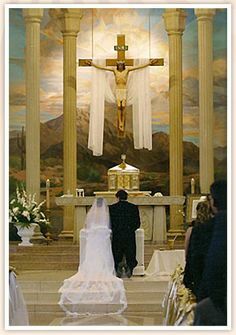 Christ raised marriage to the level of a Sacrament. Husbands and wives give themselves totally and selflessly to one another for life, and they love one another as Christ loves the Church. Marriage is open to new human life which imitates God&apos;s eternally fruitful love. Please contact the pastor at least six (6) months in advance so that the engaged couple may begin their period of preparation for reception of the Sacrament of Matrimony.